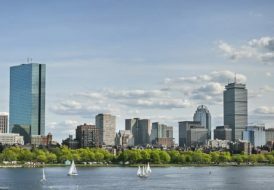 Looking for luxury home inspiration? 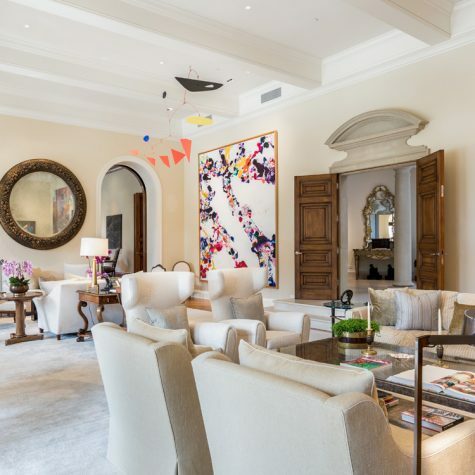 From the legendary Versace Mansion in Milan to the shores of Laguna Beach, this month’s newest batch of high-end listings marketed by the Coldwell Banker Global Luxury® program will give you a serious case of house envy. The Versace mansion is set along the Street Gardens, one of the most exclusive areas of Milan between Brera, via Manzoni and via Montenapoleone. 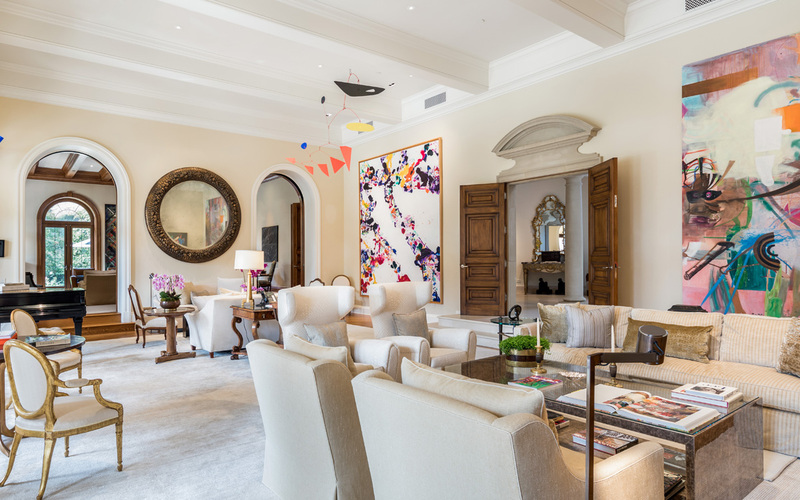 The villa perfectly encapsulates the mix of glamour and refinement that makes Milan the fashion capital of the world. 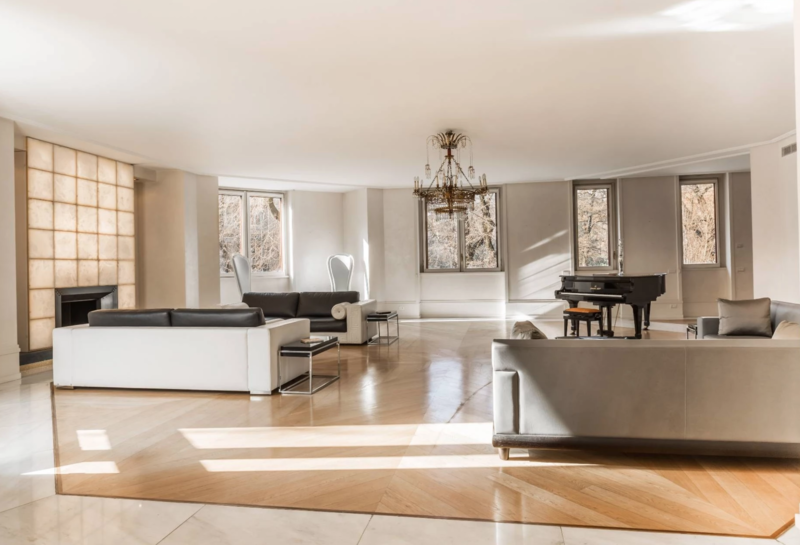 Built between 1953 and 1954, the house was designed by the architects Carlo De Carli and Antonio Carmiati, representatives of the modernist movement. Geometric shaped building was conceived as an octagon screwed onto a rectangle, and has a façade essential modernist lines. 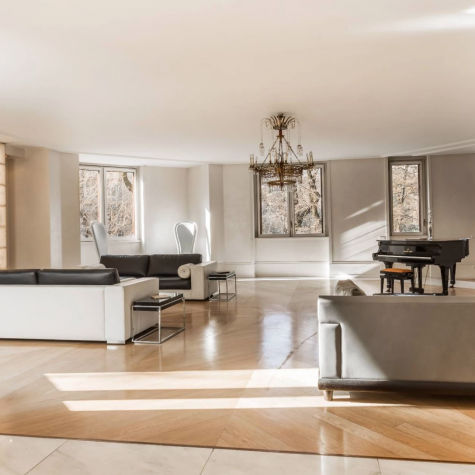 The living space spreads over four floors and 2,000 square meters, including 400 442 square meters of garden and panoramic terrace. The basement spans over 120 square meters, with a spa, a gym, an area for the staff and security guard. Offering 360-degree ocean, bay and Miami skyline views, this two-story tower suite penthouse in the sky is truly one-of-a-kind. Enter your double height foyer through your private elevator & take in breathtaking far-reaching views. This Crestron controlled smart home boasts seven terraces, a gourmet kitchen with Miele and Sub-zero appliances, second staff kitchen, formal dining room, glass staircase, expansive master suite with private balcony, entertainment den, his/hers separate bathrooms with Kohler controlled rain/steam showers, boutique style walk-in closets with separate in-room laundry, marble and wood floors as well as his and hers separate offices. This residence is an entertainer’s dream with two wet bars, media room, sauna, outdoor shower an entertainment terrace with a BBQ, TV and picturesque vistas. Set behind the prestigious Bel-Air guard-gated community of Moraga Estates rests this opulent classic Italian villa commanding nearly four acres on a rare double lot. 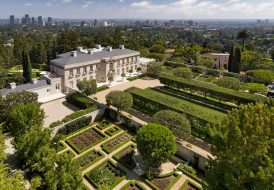 The ultra-private property was the former site to oil tycoon and philanthropist, Howard B. Keck’s estate. 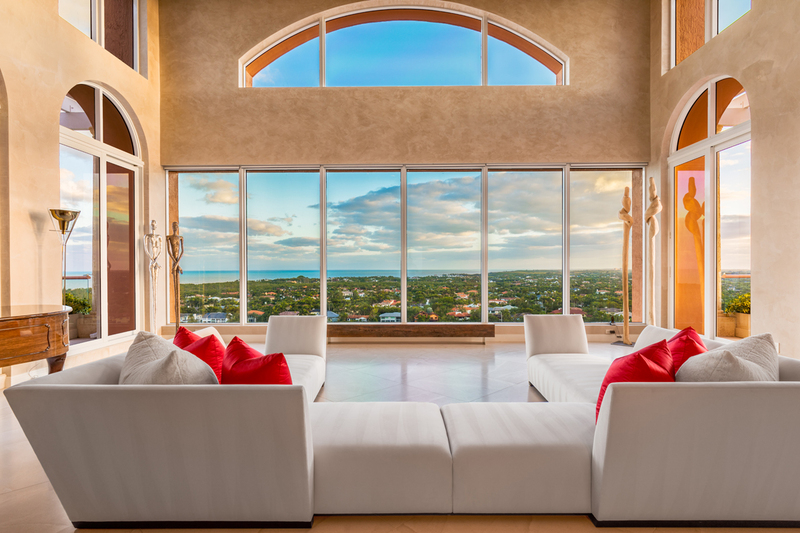 With over 14,000 square feet compromising four bedrooms and nine bathrooms, this villa boasts soaring ceilings, grand scale-sized rooms and a floor plan that is formal, yet creates a comfortable and inviting ambiance. Stunning architectural features throughout include sophisticated finishes, classical detail and elegant curved archways and windows that give way to the magnificent manicured gardens and sprawling lush grounds. Other luxurious amenities include: formal living and dining rooms, stately office/library with fireplace and walk-in bar, large master suite with fireplace, motor court for ten cars, swimming pool and a one-bedroom, two-bath guest house, Crestron sound plus AV and tranquil outdoor lounging spaces. This stunning transitional custom home crafted by SRD Build Corps rests on a massive 1.5 lot on the grand canal of Royal Palm in Boca Raton. 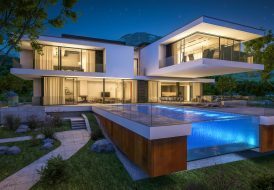 Outfitted with every imaginable amenity, the residence spans over 10,000 square feet with seven bedrooms, a club room, movie theater, gym and spacious chef’s kitchen with two islands. Many of the rooms enjoy views of the Royal Palm marina. Beyond the home, there is a covered loggia for outdoor entertaining and over 150 feet of deepwater dockage. Presenting some of the finest oceanfront views in Laguna Beach, this meticulously maintained residence designed by famed architect Chris Abel features private concrete stairs to the beach below, approximately 50 feet of frontage, and the soothing sound of crashing waves from within the preferred neighborhood of Crescent Bay. 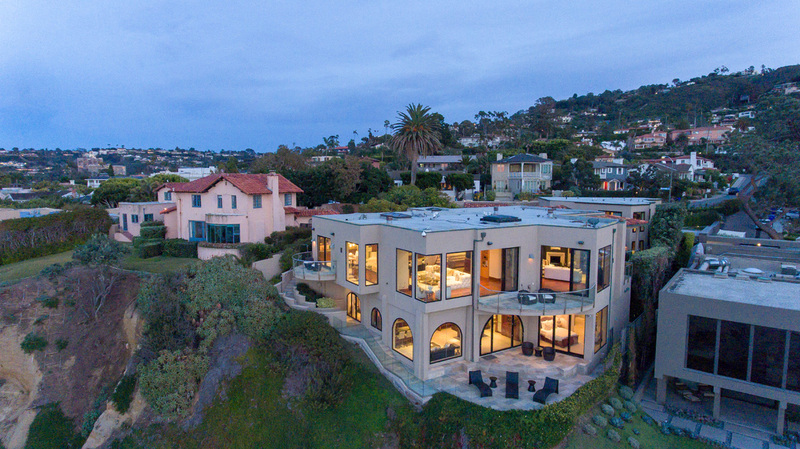 Captivating vistas of the beach, Twin Points, Two Rock Point, Dana Point, and colorful skies from a setting sun are enjoyed from all three levels of the home, which encompasses three ensuite bedrooms, four and a half baths, an elevator, and approximately 5,263 square feet of living space. A spacious deck and large mahogany-framed picture windows complement awe-inspiring views on the main level. 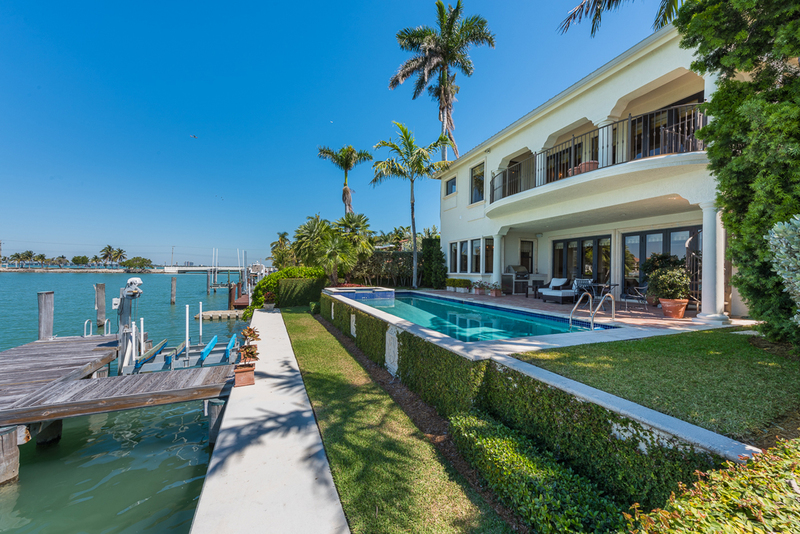 Offering sweeping views of the downtown Miami skyline and the most dramatic sunsets, this new Italian style waterfront villa offers a coveted lifestyle on open water and a spacious 9,953 square foot lot. Enter the home through a charming courtyard and beautiful foyer, where you will find five bedrooms, five bathrooms and two and one-half baths. The 6,788 square foot residence features boat dock/lift, two garages, a guest house with separate entrance, formal dining room, family room with double height ceilings, custom woodwork throughout, a gourmet kitchen with Sub-Zero and Wolf appliances, marble and wood floors, an expansive master suite with a kitchenette, his/hers walk in closets, a spa-like master bathroom and an expansive balcony offering panoramic views. 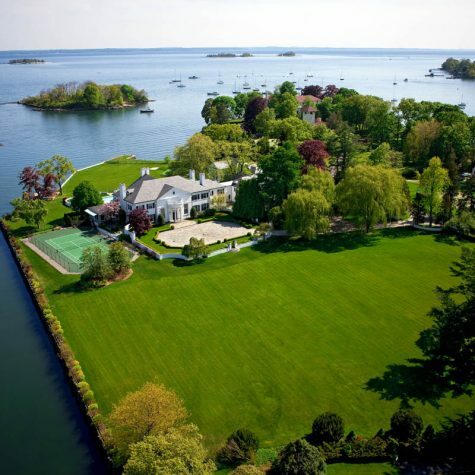 Beautifully sited in the private, gated sanctuary of Connecticut’s Indian Harbor on an enchanting six-acre peninsula, the grand brick Georgian Colonial home designed by the distinguished Polhemus and Coffin Architects has maintained its provenance over the years as one of the most distinguished and noted properties known. A long, winding driveway approach builds anticipation for the premier waterfront property. 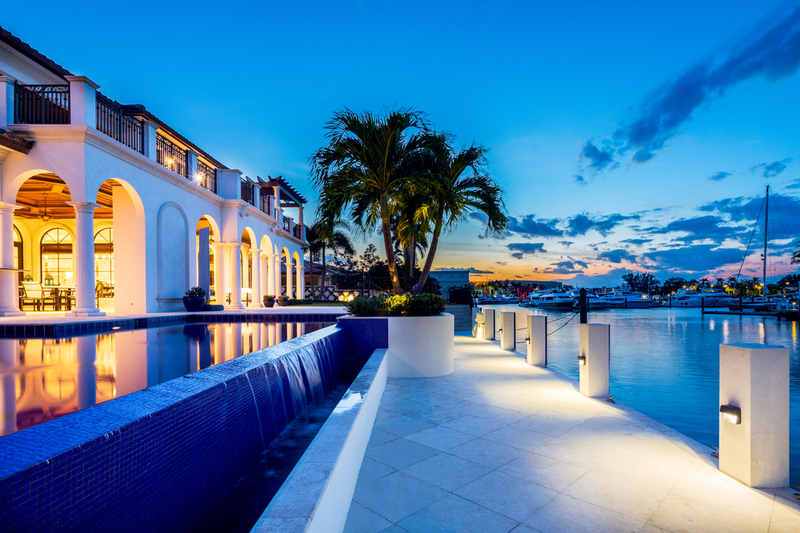 The current owners recently concluded an extensive remodeling with additions that bring this dazzling waterfront compound to new levels of luxury and refinement. Beyond compare, an exquisite entrance hall features a 3-story illuminated rotunda, elegant double staircase, and arched passageway connecting to stately rooms beyond, including an antique-paneled library with marble fireplace. Countless doors and windows open to the spectacular water vistas, and scenic views of the pool, putting green and rolling lawns. 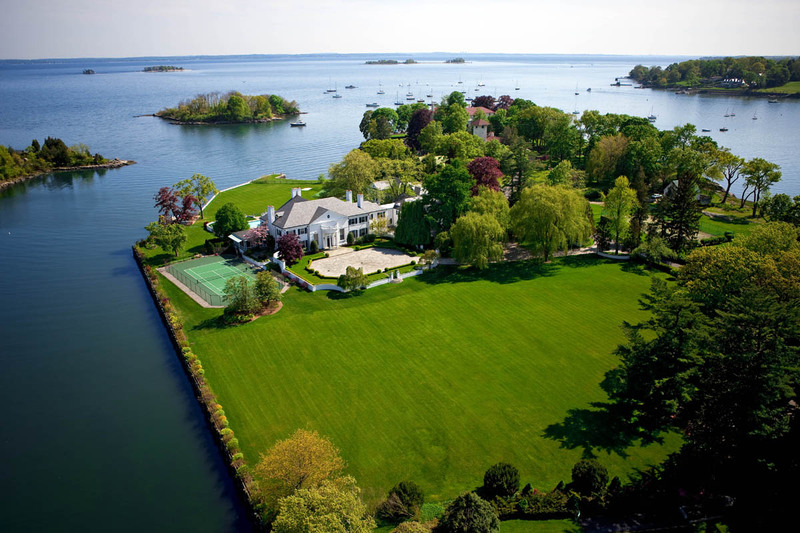 Unparalleled artistry and construction are present in this world-class estate, and one of the finest ever built on the Long Island Sound. 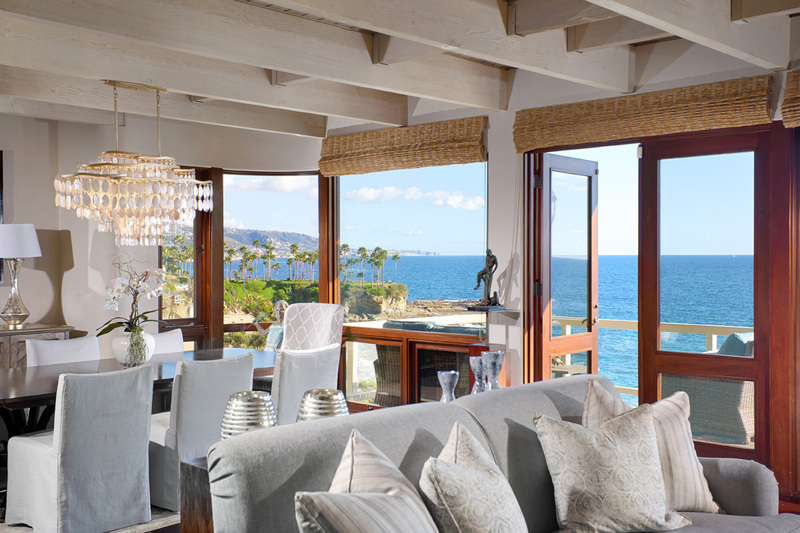 Breathtaking in every way: this exceptional oceanfront property in La Jolla personifies the luxury lifestyle. Starting with an oceanfront position and merely eight doors up from the sandy beaches of La Jolla Shores, you’ll appreciate the incredible architecture, design detail and panoramic Pacific views. The main house spans over 7,630 square feet, plus offers incredible guest quarters with 3,515 square feet and two bedrooms, a game room/bowling alley and more. 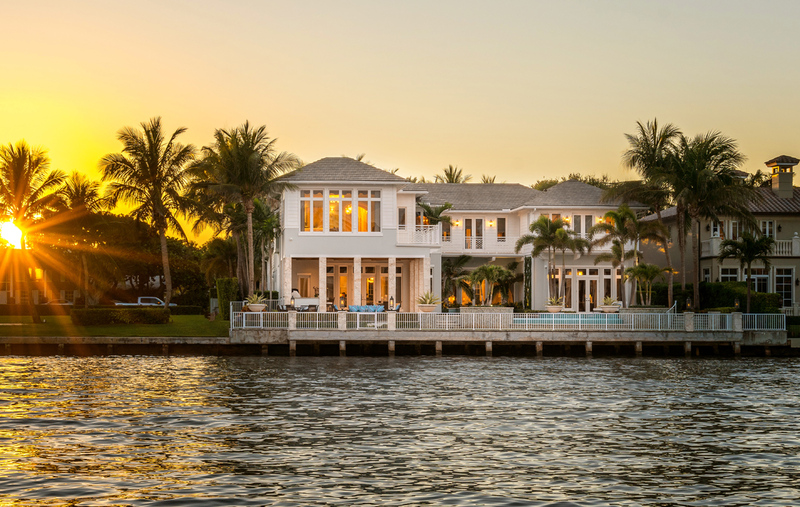 This spectacular British West Indies-inspired home by Bloomfield Builders boasts direct intracoastal access and incredible views from every room. Lushly landscaped with exceptional finishes and details throughout, the prized 11,862-square-foot estate features transitional decor by decorators unlimited, club room, theater, a beautiful multi-level infinity pool, a great summer kitchen, wine room, garage with four bays including lifts to accommodate six vehicles. Ideal for golfers, there is also a separate golf cart bay. 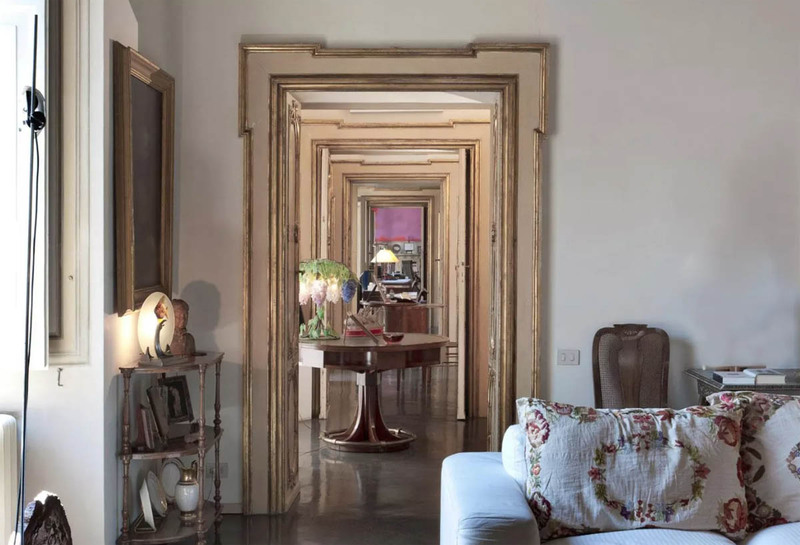 Set just a few steps from Rome’s legendary Spanish Steps, this impeccably outfitted apartment in via della Mercede in the historical Palace of Bernini beckons with three entrances, a terrace, a parking space and a cellar. Rich in amenities, it offers peaceful environment suitable for artists, writers and anyone who wants to live in the most exclusive area of the city, yet still keep a low profile. The future owner of this property will also enjoy the architectural and artistic character of the Palace and the surrounding area in which it is located.